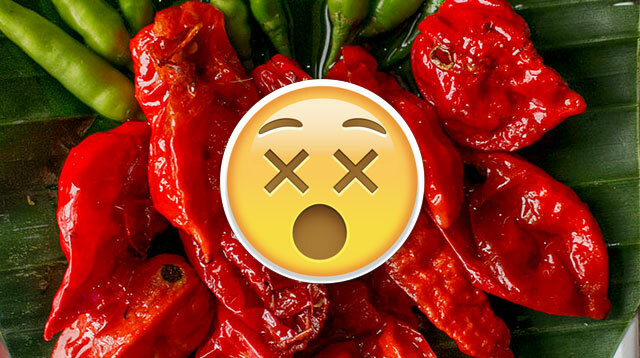 A seed from a 'Ghost Pepper' can make your mouth feel like it's on fire for about 30 minutes. To eat it in puree form? Bad idea. If you live on YouTube, or have ever been sucked into the black hole that is the Internet, then you’re probably aware of all the spicy food challenges that have been circulating the interwebs this year. The Indian Bhut Jolokia was crowned the world’s hottest pepper in 2007 (It was dethroned by the "Carolina Reaper" according to the Huffington Post). It’s more commonly called the Ghost Pepper; it’s also the first “superhot” pepper. Peppers are considered superhot once they pass the one million mark on the Scoville scale—yes, they have their own unit of measurement. In fact, one seed from a Ghost Pepper can make your mouth feel like it’s on fire for about 30 minutes. According to pepper connoisseur Ronald Primeaux, when you eat a superhot pepper, your body “thinks it’s going to die.” In a case study published in the Journal of Emergency Medicine, a 47-year-old man ate a hamburger served with ghost pepper puree…and it tore a 2.5 cm hole in his esophagus. The man’s forceful vomiting caused the tear. He was intubated for 14 days (a flexible plastic tube is placed into your trachea through your mouth or nose to help you breathe), and was only able to take in liquids after 17 days.